Working with your firm’s leaders, we help you determine your risk appetite and how to turn it into processes for faster decision making. Competitive, regulatory, operational, and black-swan pressures come from so many directions that organizations face multiple risks to success. 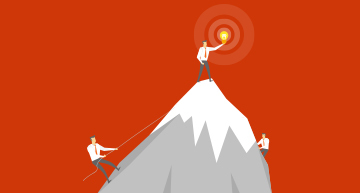 Being prepared grants competitive advantage. It can ensure continuity, increase organizational reputation, and increase shareholder value. Unfortunately most firms develop ERM for identifying, monitoring, and mitigating operational and compliance risks. The process is largely separated from strategic risk management and Strategy Execution Management (SEM), and can have disastrous consequences (such as in the banking crisis of 2008, where ERMs at the best run banks failed to identify the risk of asset-backed securities). Enter the strategic risk management framework. We offer the unique ability to develop Enterprise Risk Management that is fully aligned and intertwined with Strategy Execution Management. (See our Strategy Execution Management page for more information on SEM): The Strategic Risk Management Framework. This has multiple knock-on benefits. Yes it ensures Enterprise Risk Management is controlling for operational and compliance risks, such as fraud, human error, process failure, systems failures, and legal missteps. But a strategic risk management framework also ensures alignment with vision and mission, governance models, financial planning, R&D activities, the entering of new markets, the launch of new products, and mergers and acquisitions. And it sets risk thresholds for each business objective, effectively delegating decision making to CXOs and GMs, and increasing corporate agility. Set the acceptable risk appetite: Done at the board level, this crucial first step creates the boundaries within which an organization can prepare for risk, and should be aligned with the overall corporate strategy and its long-range financial plan. As it sets the tone for risk management, we ensure it is applicable across the organization and defines the amount and type of risk, time frames, and where and how risk affects company objectives. Identify all enterprise risks and create profiles per risk: Working with the ERM team, we breakdown each risk by type, group impacts, treatment, accountability, and ownership. We also set up communications frameworks to ensure the right internal and external teams are consulted and informed about risks on a regular basis. 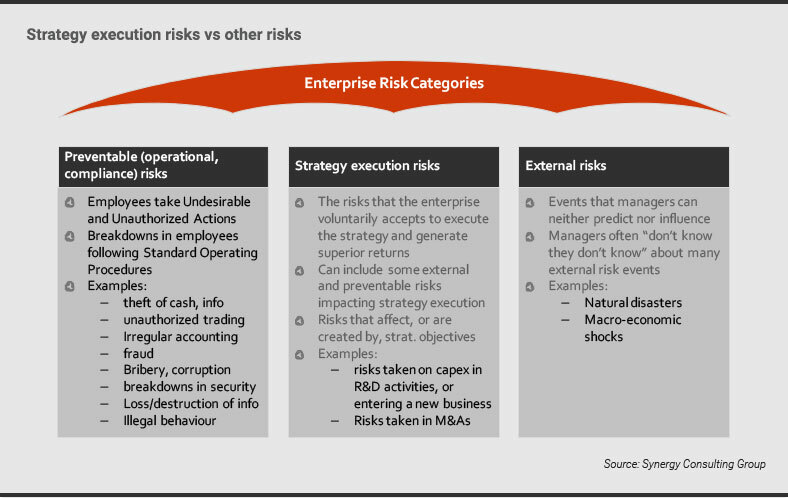 Connect risks to strategic objective to create strategic risks: Using the risk profiles as inputs, we cross-check each risk against strategic objectives to identify which risks are key, non key, or emerging. We assess the degree to which each risk can disrupt its given objectives and potential opportunities that might arise from given risks. We also translate appetites and profiles into governance models while cascading the information to ground-level staff to make risk and strategic management part of corporate culture. Define metrics for monitoring and develop mitigation plans: We work closely with the Enterprise Risk Management (ERM) Office and analytics-driven Office of Strategy Management (OSM) teams and division leaders to identify key risk indicators (KRIs) and their related controls (KCIs). We also create detailed mitigation plans for risks deemed a threat and utilization plans for risks that present opportunities. Set up monitoring: Using scorecards, risk matrices, and heat maps, we help clients monitor their risks and potential rewards. This ensures risk thresholds are aligned with strategic objectives and overall exposure – and how risk may need to be rebalanced over time.